There was a decent line up of Japanese restaurants from all over the GTA. I had already been to several of them and was interested in trying others. 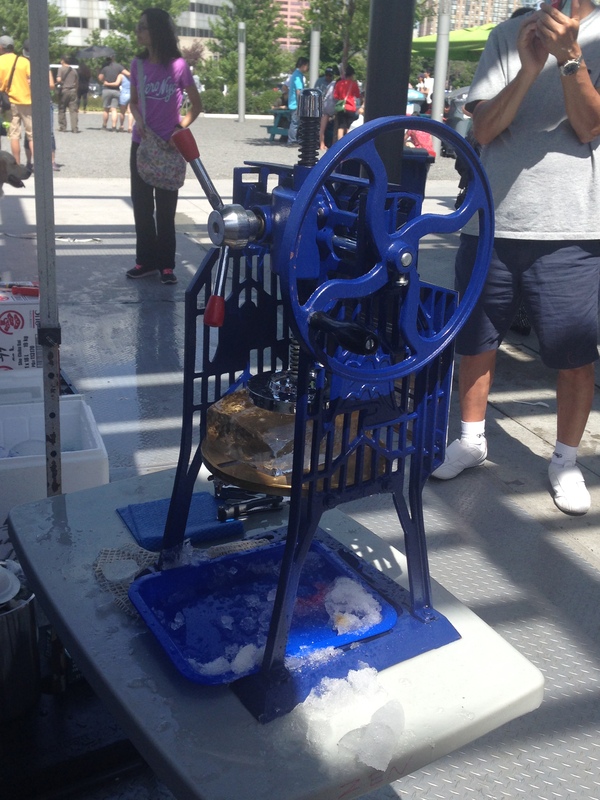 I was disappointed that the vendors weren’t making dishes from their regular menus. 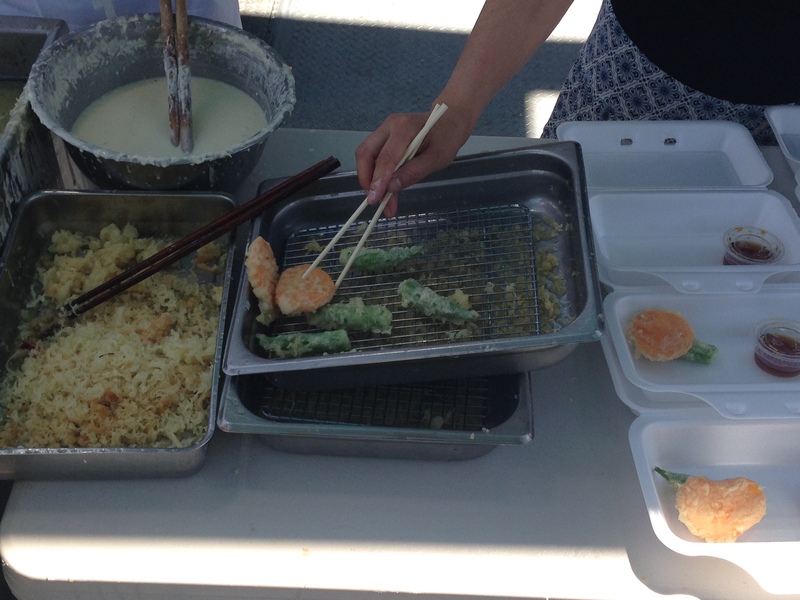 The most common foods offered at the festival included cold noodles, deep fried octopus balls, and shaved ice. I was disappointed that I didn’t have enough time to try the sake. Perhaps the most unique, coveted, and surprising vendor was Royce’ Chocolates. They are Japanese-made (in Hokkaido) chocolates that are sold internationally. The only Canadian location is in Vancouver. They were selling for $26 for a box of 24 pieces. They sold out of all of their flavours except for Champagne by the time I got there, so I wasn’t able to get any. My overall impression is that the food at the Japan Festival was better executed than the food at all of the Chinese food festivals within the GTA. 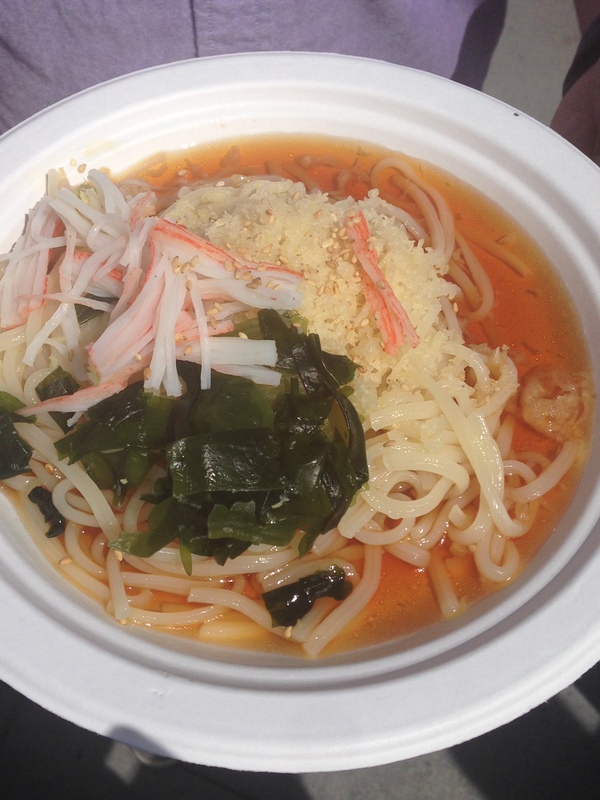 The flavours of the food at the Japan Festival were more delicate and made with far less MSG and sodium. Although, the Chinese food festivals are larger and have much more selection. Also, I want to note that our grilled chicken skewers were undercooked and John got food poisoning that night. We still plan to return if the Japan Festival becomes an annual event. They were selling sushi and maki rolls at very reasonable prices. We didn’t try any, because the rolls didn’t look very well-made to me. Also, the reviews for this restaurant were only 3.6/5 on Zomato at the time. 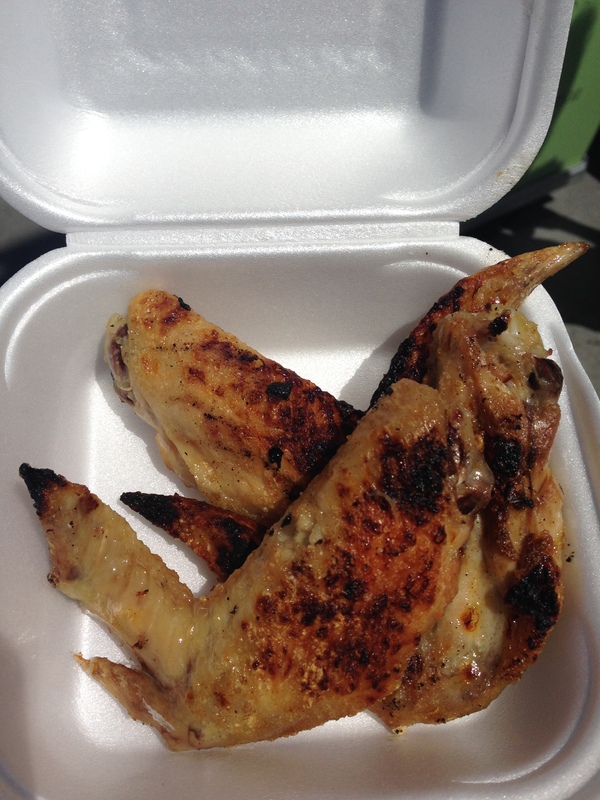 We ordered the charcoal grilled chicken wings and we were Not disappointed. The seasoning was perfect, flavourful and well balanced without being too salty. I would have preferred a touch more sweetness, but they were perfectly cooked, so I had no complaints. Okay, maybe one complaint, they were kind of expensive – $6 for 3 pieces. We didn’t try anything from Kinka, because I really didn’t like Guu (former name). 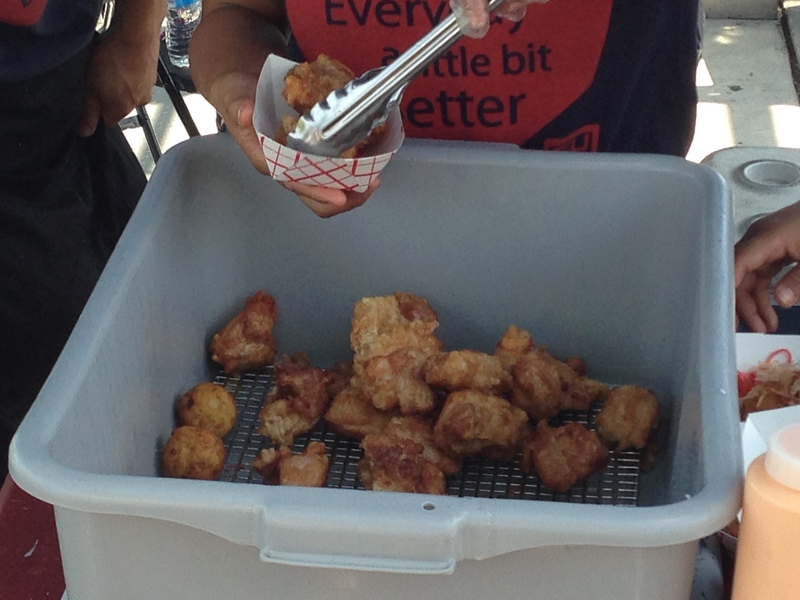 From what I could tell, the deep fried calamari looked over fried, greasy, and soggy. Also, the fried chicken looked too heavily battered. See my review of Kinton Ramen here. Mye is a restaurant in Oakville that I had never heard of before. It was the first vendor that I lined up for. I chose them because their cooks looked the most professional and clean. They were all in proper chefs uniforms and hats. However, I was appalled at the poor food handling practices that I witnessed. They were lining up styrofoam take out boxes on a table. At one point, the wind blew several of their boxes and dip containers onto the floor. I watched the cashier pick them up and place them next to the plating table. Then the porter started to reuse them. I told the cashier that the porter can’t use those boxes or dips, because they had fallen on the floor. She then went to speak to the porter before she placed the dirty boxes on a different table. She did Not put them in the garbage. I highly suspect that they were planning on using them later. Also, the porter, who was touching her dirty clothes and phone, was placing her hands in the takeout boxes to hold them down. For all we know, John got food poisoning from them and not the raw (but delicious) chicken that we had from Zakkushi. By the way, the tempura wasn’t even good. The bean was way too bland, the sweet potato was flavourless and undercooked, and the batter was too heavy and crunchy (not authentic Japanese tempura batter). See my review of Ryoji Ramen here. 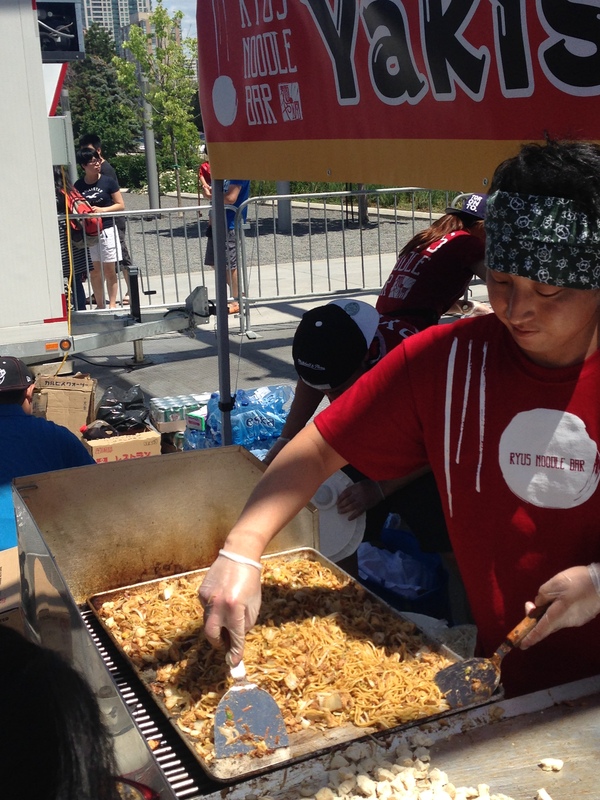 They were the only vendor that sold fried noodles. I was tempted to try them, because they looked good, but they were really overpriced, especially since the chicken and pork was barely visible. See my review of Tohenboku’s chicken ramen here. We waited in line for what feels like over an hour for the charcoal grilled chicken skewers (yakitori). They were the slowest moving line from what we could tell. It was quite expensive too, three small skewers for $5. We ordered 6 skewers and 3 of them were undercooked. In fact, John got food poisoning that night (but I wouldn’t be surprised if it was because of the tempura we had from Mye Restaurant). 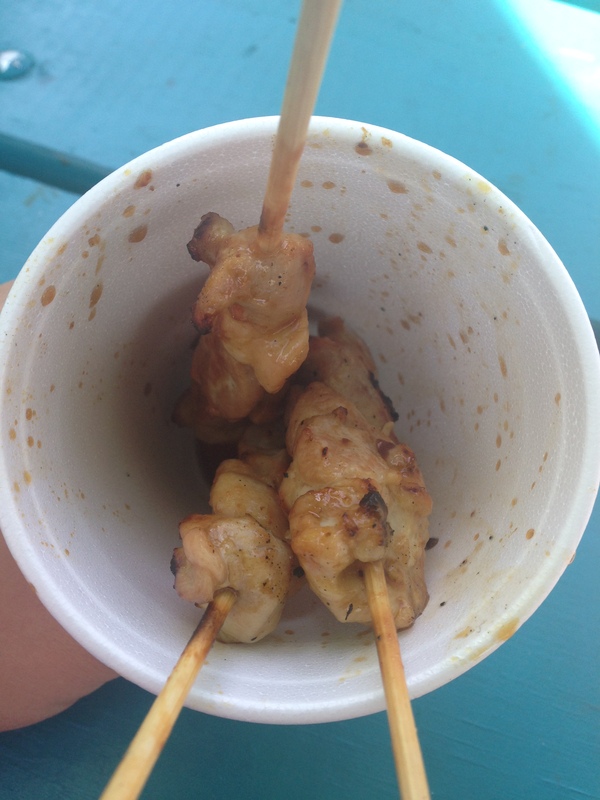 Looking back, we should have gone back to the vendor and asked them to give us fully cooked skewers. Although, I will say that the seasoning was great! The flavours were delicate and lightly salted. I would definitely consider going to the restaurant. See my review of Raijin here. John and I had a wonderful dinner at Zen Japanese Restaurant last year and their booth did not disappoint. In fact, it was so good that we lined up twice for their food! We had their cold udon noodles and their roasted green tea shaved ice. The cold udon noodles were delicious! The sauce was complex, well-balanced, addictive, and not too salty. The roasted green tea shaved ice was Perfectly sweetened, rich, and incredibly robust in roasted tea flavour. 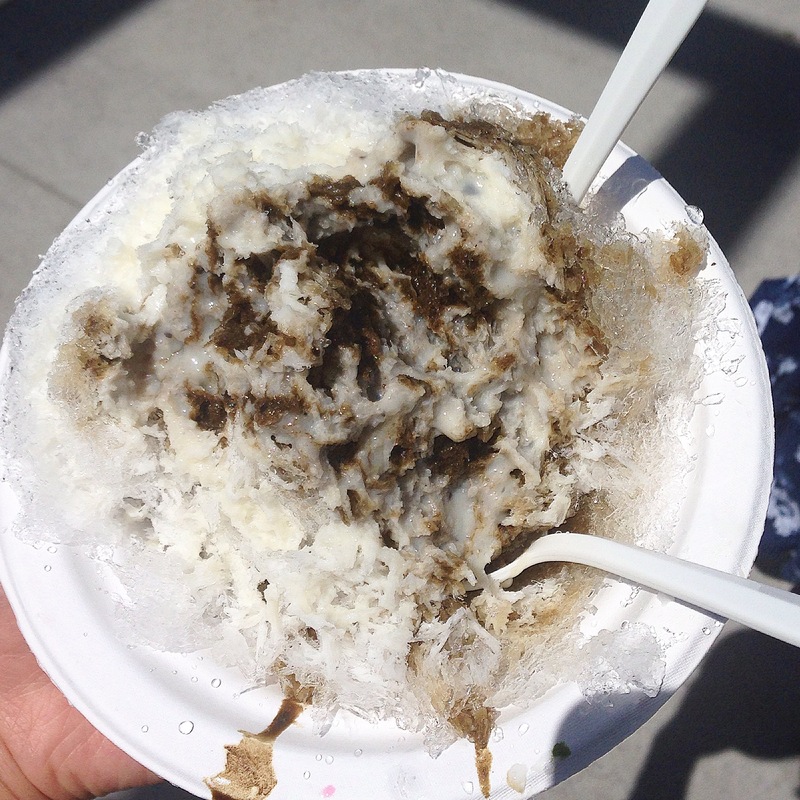 The texture of the shaved ice was quite rough (i.e. large ice flakes), but the amazing roasted tea flavour more than made up for it. I was disappointed and surprised to see that their strawberry and melon flavoured shaved ices were made with artificially coloured and flavoured syrups.